This screen keeps track of the ice bath. 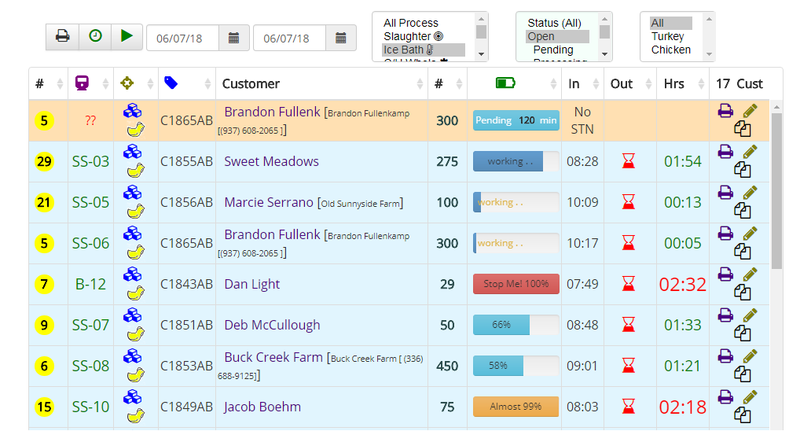 The system lets you assign a slaughter sequence (yellow number) to each Customer, so you know what is coming down the line. Each row shows the bath number, name, qty, start time and duration. Large red numbers flash when time is up. The calendar shows 2 numbers for each species. The first is number of Flocks, the second is number of animals. So on August 9, there are 5 Customers bringing a total of 527 Chickens. And all you had to do was enter the Order. 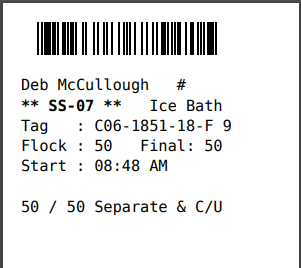 When the ice bath is done, print an easy to read/scan label to keep with the flock (or partial flock). It also shows the cutting instructions.